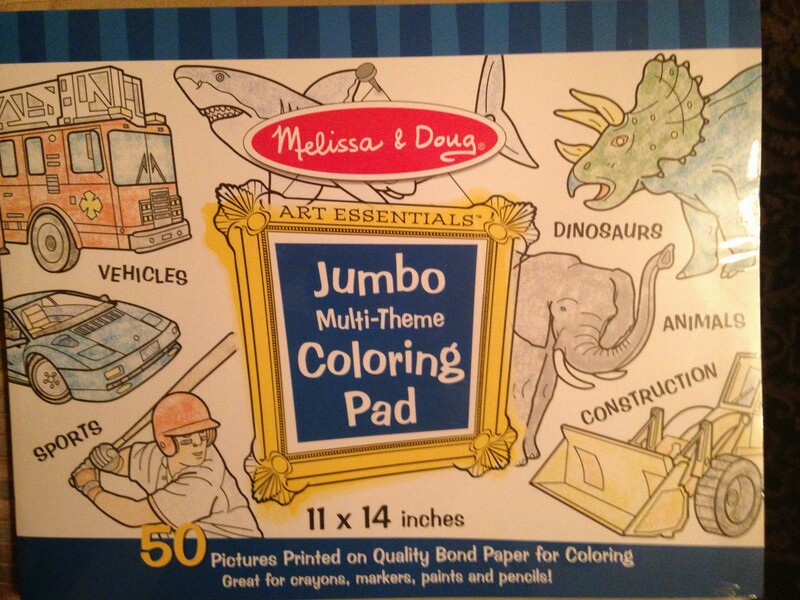 Color With Melissa and Doug: Your Child Won’t Know He Is Getting Ready to Write! Tear off these large sheets of sturdy paper so it lies flat for easy coloring. One of my favorite toy makers (sorry, Santa!) is Melissa and Doug. Their well-designed toys are entertaining to children and satisfy the esthetic and educational needs of parents. But did you know that you can use their fabulous coloring pads to develop pre-writing skills in your preschooler? Their jumbo coloring pads come in a wide range of themes. You can buy a vehicle, princess or animal theme, or go all-out with a blue/pink combo pack that either has dinos/vehicles/sports and hearts/princesses/fairies. I know it is not totally PC, but I have had specific requests from little clients for themes that speak to them. You like what you like. I used the “blue” coloring pad for my illustration since my caseload is about 75% boys, and they are usually less likely to want to color. I have to work harder to engage the guys in fine motor play. The animal-themed book appeals to all children. Now….you get the best results when you color together. How YOU color, and what you demonstrate and say about your coloring will make all the difference! When you know what will build their skills, coloring turns into a fun learning opportunity for a preschooler. I use Handwriting Without Tears in my private practice. Their preschool workbooks are designed developmentally to bring your child through the stages of pre-writing all the way to writing uppercase letters. They have a nice coloring section, and each page has some coloring opportunities with each letter. But some children need more practice with controlling a crayon. Enter Melissa and Doug and you. Preparation: Select your sheet for maximum interest (your child’s) and target pages that have a variety of vertical, horizontal, and circular shapes. If you know that your child loves cars and is not making a circular scribble yet, then you really want a picture of cars, a sun, or an animal sheet with lots of little animal heads to color in. You are going to color upside down, with your paper directly above your child’s. He can see the compelling details of your picture, and can more easily mimic your strokes. Feel free to ad-lib. Who says you cannot add circular clouds, vertical blades of grass, or a horizontal road? Step 1: Identify what stroke (vertical, horizontal, circular) your child is commonly using. Commonly, young children exclusively use a vertical stroke. Older child with some fine motor delays will turn her paper to fill in shapes rather than alter her crayon stroke. Step 2: Demonstrate a new stroke, and mention that grown-ups and older kids use their fingers in different ways to color in shapes depending on the shape they want to fill in. Mention that kids who are learning may have to go slower to control their crayon. You can offer to work on part of their sheet, or on yours. You might say that you tend to use too much force when you are trying something new, so you will be making an effort to press lightly and not break the crayon. Small people like to hear that adults make mistakes too. Step 3: Reward and reinforce all sincere effort. Some cautious children are hesitant to try something new in front of you to avoid a witness to their failure, but will practice on their own. Some kids need more help and support from an occupational therapist. But everyone loves the Melissa and Doug pages! This entry was posted in handwriting, occupational therapy, toy/equipment review and tagged coloring books for preschoolers, developing handwriting skills, Melissa and Doug on December 21, 2014 by Tranquil Babies. Autism and the Happiest Toddler Approach: Why Does It Work? All children on the autism spectrum have two things in common: they have difficulty with communication and less social skills than would be expected for their age. Many, but not all, children with ASD struggle with sensory processing. The level of struggle is so unique that these kids look very different from one another most of the time. But when they get frustrated, they all can break down into aggression, avoidance and tantrums that last and last. I recently attended a professional training where the presenter remarked that those meltdowns were not only a sign of autism but inevitable, and “you just let the child have his tantrum”. I think that abandons the child when he needs the most support, but is the least available for traditional talk-based or token strategies. I have also spoken with behavioral-managment clinicians who go straight through to a time-out warning when a child begins to resist or complain. So why does The Happiest Toddler (THT) strategy work well for children on the ASD spectrum? At first glance, it seems that it would be less successful than standard behavioral approaches, as it relies on reflecting back feelings and supporting social and self-control skills. Initiating and sustaining direct verbal give-and-take is often the greatest limitation of these children. Kids on the spectrum really benefit from the emphasis on non-verbal messages, the repetition, and the indirect teaching that occurs using Dr. Karp’s techniques. The adult matches the child’s language level at the time of the tantrum, and social interaction matches a child’s skill level as well. If a child with ASD is able to function above an 18-month level, at any chronological age, then this approach can be very effective in helping him achieve a calmer state and learn self-control skills. I modify the program to assume that a child will need more opportunities to practice and fewer distractions to use techniques such as Gossiping and Patience-stretching. My target level of repetition, voice volume and language complexity may have to be very fine-tuned for each child. I may need to select words that he commonly uses, or words that have previously shown a positive response. I will strive for consistency in my delivery once I have created a plan, and accept that generalization of using THT (expanding this to other situations, or even to the parents and nannies) is going to take longer. This strategy works more effectively with a “floor-time” model than with an ABA model, but it can be used with any program. The definitive measure of whether this approach will work is the willingness of adults to adapt their response to a child’s unique emotional and communication needs. This entry was posted in autism, behavior issues, parenting, toddlers and tagged autism in toddlers, happiest toddler on the block on December 14, 2014 by Tranquil Babies.